The label “revisionist Western” has been lobbed around for so long, and in so many movies, that it seems to have lost most of its bite. After all, it’s pretty hard to call a Western “revisionist” if it represents the same old vision of the American frontier, stained with the blood and salty tears of prototypical masculine icons. Sure, Christian Bale feels really bad about all that genocide in a film like “Hostiles,” but only because the camera lingers on him longer than usual. It’s the same old story, the same old song and dance. So when David and Nathan Zellner’s “Damsel” begins with a world-weary preacher, played by Robert Forster, admitting that the American west is pointless and stupid, and then strips himself naked and walks off to die in the desert, it’s a refreshing change of pace. 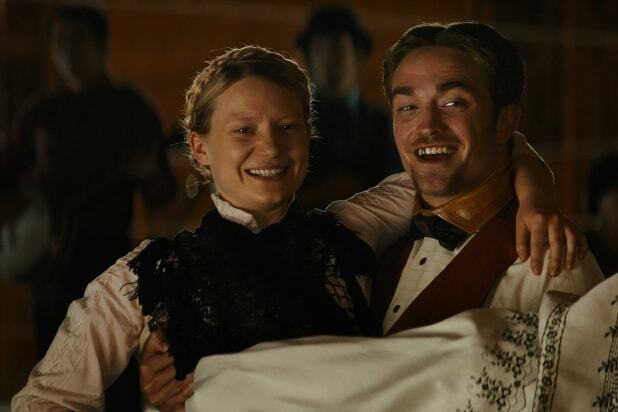 And when the film segues into a literal song and dance, it feels like we really are watching a new sort of vision, even though “Damsel” takes a while to reveal its true angle. Robert Pattinson stars as Samuel, a proper dandy who wanders into town with a guitar on his back and an adorable pygmy horse named Butterscotch. He’s recruited the local alcoholic Parson Henry (David Zellner) to accompany him on a mission to rescue Penelope (Mia Wasikowska), the woman he loves, from her despicable kidnapper, Anton (Gabe Casdorph, “Yellowstone”). The plan, such as it is, is to ambush Anton, kill him dead, and propose to Penelope right then and there. When she says yes, which she certainly will, Parson Henry will emerge like a miracle, and wed them in the eyes of God, right away, lickety-split. Hurray. As a plot, it’s enough to make any sane person roll their eyes. Fortunately, it turns out that the Zellners (“Kumiko, The Treasure Hunter”), who wrote the screenplay as well as directed, are also quite sane. No sooner is Anton horribly slaughtered than we discover that Penelope was never kidnapped, that she was happily married to Anton, and that Samuel is and always has been a delusional stalker who thinks he’s entitled to Penelope just because she’s a pretty woman. It’s a delusion that is shared, we gradually realize, by every single man in her path. “Damsel” marvelously shifts gears from an eccentric heroic fable into a biting indictment of the Western storytelling tradition, with Wasikowska caught in a state of perpetual explosion as she rages at every man who tries to claim her as their own. Fortunately, she’s good at shooting, good at rigging dynamite, and even good at throwing rocks, so nobody gets away without at least some bumps and bruises, and many of her would-be captors wind up satisfyingly dead. “Damsel” is viciously whimsical, if such a thing is possible, and it’s thrillingly subversive. But the punchline comes early, and it’s only repeated as the film progresses. We’re introduced to Penelope’s story through the eyes of an old-fashioned, sexist man, so when she takes over the narrative it’s a treat, because she’s taking the whole system down a peg. But it’s also depressing, since she can only do so after her happiness has been stolen from her, and because she’s doomed to suffer the same indignities over and over. The sheer repetition of Penelope’s journey, as every new man she encounters tries to possess her, vividly illustrates the insufferable status quo with which she’s forced to deal. She is, if anything, Odysseus and Penelope combined, fending off unwanted suitors as she embarks on the perilous journey. How very clever as an idea, and yet as a comedy it’s clearly hitting the same note over and over. The Zellners balance their significant theme with light humor, and they clearly decided that the theme was ultimately more important. They’re almost certainly right, but that doesn’t make “Damsel” any funnier, so it doesn’t prevent the film from dragging a bit in the second half. Pattinson steals the first third of “Damsel.” He’s so foolishly committed to his character, and to Penelope, that one can easily imagine a film in which he really was the star. But when Wasikowska takes over, it’s hard to imagine anyone else leading this film. She seems all too eager to burn down a whole system that holds her up as a feminine ideal, as someone to be coveted instead of respected, and “Damsel” gives her ample opportunity to let loose and punch an entire culture in the jaw. “Damsel” is the best kind of revisionist Western, with a fresh perspective, and a vital, relevant point to make. That the film’s vision is narrowly focused is both the reason for its existence and its sole drawback, a sacrifice at the altar of plot and pacing in order to appease the thematic gods. That sacrifice was clearly accepted. “Damsel” is a spry and illuminating comedy, no matter how many times it repeats its jokes. 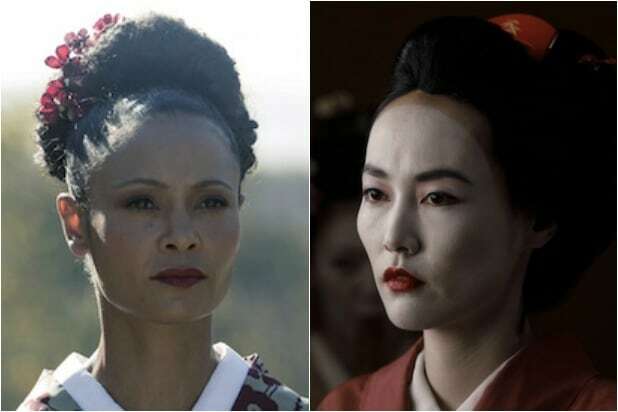 We finally got a glimpse of Shogun World in "Westworld," and the idea to mash up the two universes isn't just a coincidence. There's a long history of Westerns borrowing from samurai cinema and the other way around. Japanese filmmaker Akira Kurosawa studied the work of director John Ford, which, in turn, led to many of Kurosawa's movies to be remade as Spaghetti Westerns. The cowboy and the samurai are each lone wanderers in a lawless world, so a crossover of themes is plausible. Here are 10 instances in which the West met the East. Kurosawa's landmark film, "Seven Samurai," was highly influential on modern action cinema, but its most direct descendant was John Sturges' "The Magnificent Seven," starring Yul Brynner, Steve McQueen, Charles Bronson and Eli Wallach. The film is a remake, but its representation of American ideals of heroism and underdog spirit have propelled it to become its own classic. Another Kurosawa remake, "Yojimbo" is about a mysterious, quiet and lone ronin who wanders into a small town and fights to end the warring between two rival gangs. And "A Fistful of Dollars," Sergio Leone's unauthorized remake, is literally the same thing. Clint Eastwood's scowling menace is to just about any Western what Toshiro Mifune's crazed intensity is to samurai movies. "Yojimbo" would also get a sequel, "Sanjuro," as would Eastwood's "Man With No Name" series in "For a Few Dollars More" and "The Good, The Bad and the Ugly." Zatoichi is one of Japan's longest running samurai characters -- a blind warrior originally played by actor Shintaro Katsu -- who appeared in a total of 26 films and a subsequent TV series. The Spaghetti Western "Blindman" is likewise about a sightless hired gun inspired by the Zatoichi character. And the 17th film in the Zatoichi series would be directly remade as the Rutger Hauer action movie "Blind Fury." In 1992, Clint Eastwood deconstructed the genre that made him famous with "Unforgiven," a Western about a gunslinger forced to face his murderous past. Twenty-one years later, Lee Sung-il and Ken Watanabe turned "Unforgiven" into a samurai tale with the saga of an infamous warrior who wants to live in peace as samurai are apprehended in 19th century Japan. Toshiro Mifune put forth one of his most famous performances in "The Seven Samurai," as did Charles Bronson in that film's remake, "The Magnificent Seven." "Red Sun" saw both actors -- and both genres -- collide, as an outlaw is forced to team up with a samurai to help recover a Japanese ambassador's gift from bandits who left the outlaw for dead. Masaki Kobayashi's samurai classic is about an elder ronin who wishes to find an honorable place to kill himself. The Spaghetti Western is more gory and psychedelic, but is loosely based on "Harakiri." In this Spaghetti Western, Tetsuro Tamba plays a samurai who turns tricks and joins a posse of bandits that intends to rob a train filled with gold that's heading across the Mexican border. "Seven Samurai" star Tatsuya Nakadai shows off his skills with a machete instead of a sword as villain James Elfego, the leader of the Comanchero gang, in this Spaghetti Western. While not a direct remake of "Yojimbo," the Spaghetti Western classic "Django" starring Franco Nero is another story of a lone gunslinger taking on two warring gangs. Takashi Miike's stylized samurai action movie is a stylized, East meets West homage to Spaghetti Westerns that even stars Quentin Tarantino -- who has borrowed liberally from both Westerns and Japanese cinema in his own films -- in a small role.